You fly into Africa... to Bamako, the capital of Mali. You leave the airport, board a rusty old Mercedes minibus which was dumped in Europe probably 15 years ago. The five hour journey takes you through red dust countryside and huts along the road. Whenever your vehicle stops woman who wait along the road in front of their huts out of handmade mud bricks, come quickly to your window trying to make a sell to generate some income. The journey continues sharing the road with even older trucks, people on rooftops, donkey-carts and Malians walking from village to village. After hours witnessing some of Mali's rural life along one of its main roads between Bamako and Segou, you leave the (hardly) paved road and turn right into the Sahel, the semi-desert sister of the Sahara. There is no more maverick-dangerous traffic, no overloaded trucks or broken down cars; in fact there is no more motorised traffic at all. Farmers, too poor and uneducated to use advanced tools or fertilizers, are trying to make the best out of the meager land. Currently it is the "season of plenty" which means the soils have recently delivered harvests but how must it be to be here in the "hungry season" when there is no water and no food? You arrive in the village Niamana. As soon as kids spot the vehicle (remember, no cars) they get very excited which quadruples when then see "tibbaboo". This is the friendly word in Bambara, the most widely spoken language in Mali, for white people. The kids scream loud due to excitement with an heart touching smile on their face. You arrive at Youchau's family's house. Niamana is inspiring, kind of sobering. Imagine you strip away the "matrix" of our busy life-style full of gadgets, information overload with TV and daily swamp of emails being always connected. No water coming from tap (there is a well) and no electricity (there is a solar panel powering a lamp at night) and no mobile phone reception (there is one landline). You feel like being transferred into a village 100 years ago, start feeling settled into an extremely poor yet friendly community. The poverty bothers you and you start thinking how you could make a difference (next of being an attraction to the kids). A happy young kid comes up to you and when he smiles at you you feel happy and smile back. Amadou is a typical rural Malian kid. Although being 10 years old he looks much smaller due to not getting enough good food. You learn that he talks 5km each morning to get to school. There he squeezes himself into a small, old class-room together with 100 other kids. Most of the kids don't find a table and almost none of them has something to write. Many kids are hungry which makes learning even harder. You identify yourself with Amadou and ask yourself "could I have learned under these conditions?" You learn that 4 out of 5 people can not read or write. 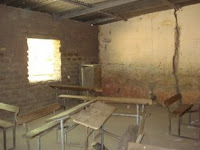 Teaching facilities are so basic, classrooms missing and overfilled that hundreds of the village's kids have no chance to go to school at all. However, there is hope: Elders, teachers and families of the community see education as the key to provide their children with the chance of a better future. They free their kids from work in the fields or households, they try to safe money to be able to pay for the teachers' salary. You think of Amadou and the hundreds of kids without a chance to receive education. You imagine how the the next generation of this country could develop through education. You remember that, although school was not always fun for you, it allowed you to read your favorite books, to learn, to study, to vote, to get your jobs... Where would You be without Education? 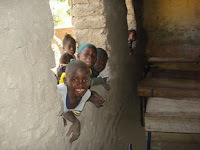 PS: The Mali Initiative works to improve the education of children in Mali. Get involved. For more information see http://www.reachmaliproject.org.au/.